Manuel Pellegrini (R) looks on anxiously as he prepares to make a triple substitution against Wigan in the FA Cup. Last summer, before he had even been appointed Manchester City manager, an insight into the intense job description being detailed to Manuel Pellegrini was posted for all to see on the clubâs official website. The chairman, Khaldoon al-Mubarak, made it abundantly clear that City were expecting to win multiple honors. This year, next year, and so on. "The target now is to win every competition we play in," said al-Mubarak. "That is the target, quite simply. It’s a high ambition but we have the organization and the squad to get us there…I am saying it with confidence." One week ago, City were basking in the glow of the first honor of the season, one they expected to be the first of many. Quadruple talk seemed a little ambitious – admittedly, the Champions League was a long shot on the back of a frustrating 0-2 first-leg deficit against Barcelona – but the FA Cup and Premier League both looked totally achievable. One week later, they are digesting an unfathomable result. It barely seemed possible for City to be outmanouvred at home by Wigan, who play their football a devision below them. It was a shuddering blow to be exposed again to a supposedly freak result against the opponent who beat them in the FA Cup final last season. It also puts a new complexion on the week ahead. Where City have been trying to convince themselves that there was no reason they could not inflict a powerhouse result on Barcelona at Camp Nou on Wednesday, now they are under extra pressure. The prospect of slipping out of two competitions in four days sits uncomfortably at a club who so directly in pre-season outlined their ambition to win everything. And in the background, observing City’s body language for signs of weakness, is Jose Mourinho. It is easy to imagine he was cackling like a cartoon villain as he waited for the referee’s final whistle to confirm City could not rescue themselves against Wigan. 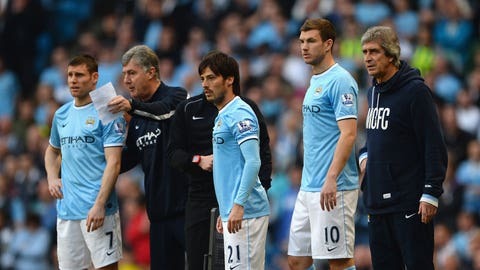 Pellegrini’s side need to make up nine points in the Premier League to catch up with Chelsea. They have the games to do so, but the fixture list looks challenging. They have some complicated assignments away from home: a derby against Manchester United, then Arsenal, then Liverpool, in the run-up to Easter. Of course, City still have a fine chance of reclaiming the Premier League trophy, and with Barcelona also stuttering, bouncing back at Camp Nou is not completely out of the question. There will be two wounded animals in the Champions League ring on Wednesday. Tata Martino’s lament after losing to Valladolid was pretty comprehensive: "We completely failed in generating play," he said. "We lacked what makes us Barca: good elaboration in our build-up, finding spaces, breaking through on the wings and having depth." This situation is a fascinating test of Pellegrini’s mettle. Although he has gained considerable credit and popularity for the refinements he has brought to City’s game in a season when he has had to get used to English football, the owners have made it clear they will assess their managers on trophies. For all of Pellegrini’s qualities, there is a notable trophy shortage since he came to Europe. This is his tenth season since leaving South American football, and he arrived at City with just the one InterToto Cup with Villarreal looking a little lonely on his CV. Although he only spent one season with a regular trophy-hunting team during his nine years in Spain, when he was with Real Madrid, the nagging doubt persists about his ruthlessness when it comes to knock-out football. In the Champions League, a team rebuilt around the purchases of Cristiano Ronaldo, Kaka and Xabi Alonso were embarrassingly ousted by Lyon in the round of 16. There have been other galling European tumbles. His Villarreal team succumbed to nerves in a Champions League semi-final against Arsenal in 2006. Last season his Malaga side caved in agonisingly late in a quarter-final against Borussia Dortmund. "We reacted too late," mused Pellegrini on the defeat against Wigan. From now until the end of the season, City cannot afford to be at all casual about when they switch on. Pellegrini showed he could push City over the line when they did react – rallying brilliantly to beat Sunderland from a losing position in the Capital One Cup final. Now Pellegrini has to lift and re-focus City once again. At least one more trophy from this season would appear to be a must.